The site of a settlement dating to between the Roman and Early Medieval period. 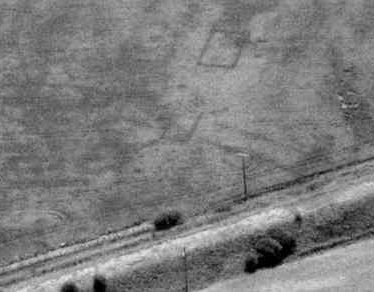 It is known from cropmarks of enclosures and linear features which are visible on aerial photographs. The cropmarks are similar to those of Saxon Palaces. It is located 800m north east of Snowford Bridge. The site of a moat at the Pleasaunce. It was of Medieval date and enclosed a timber banqueting hall. It is visible as an earthwork and is situated 700m north west of Kenilworth Castle. Documentary evidence states that the kings of Mercia used to visit their royal estate at Wellesbourne in the Early Medieval period. Finds of pottery from this period have been made which suggest the site of a settlement, Church Street Wellesbourne. Explore Palaces and Chateaus around Warwickshire. This map shows markers for every photo, article, historic site and catalogue record within the Palaces and Chateaus category.